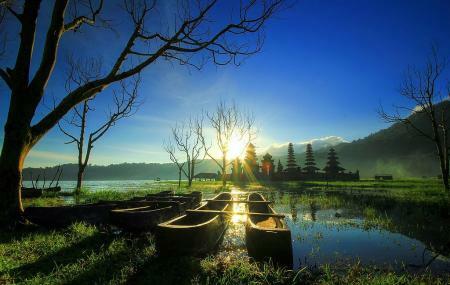 Lake Tamblingan is a caldera lake formed inside an ancient caldera, set right at the foot of Mount Lesung in Munduk administrative village of Banjar. Surrounded by a dense forest along with the remains of the 10th-century Tamblingan civilization, the lake is a great picnic spot to unwind from the buzz of the city and to spend time in the laps of nature. Spend time strolling across the pristine lake, take a dozen photographs for your social media, and discover the small-sized ancient temples that dot the area. How popular is Danau Tamblingan? People normally club together Munduk Waterfall and Banyumala Waterfall while planning their visit to Danau Tamblingan. Beautiful scenenry, peaceful place, and very interesting place to explore, especially the flora. I wasn't sure whether it was a heaven on earth, or I did died and went to heaven when I visited this place... Worth it . They have boat rent. The only minus was just pile of trash at the side of the lake.. and also the spooky toilets..
Did a camp 3nights 2days. The entrance go thru inside. Passing small way in the forest, then end you can find the lake. Narrow lake. Been there when the water level quite low. Very cold in the night. Not electricity in the nite and that made you see the clear skies with stars spreading. Very good view! Luv it! What a good experience to be there! !